Pre-Order Day is here! 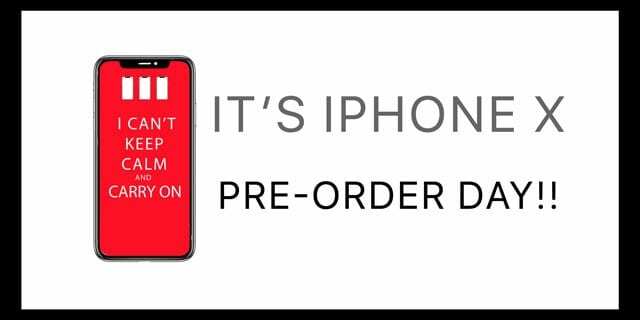 We’ve seen several reports suggesting that Apple won’t have enough iPhone Xs to meet the pre-order demand, so remember to set your clocks for 12:01 a.m. Pacific Time in the US to get your order in asap. We recommend using Apple’s mobile app instead of the website and set-up your order now, including picking your iPhone X color, size, and your mobile carrier. Additionally, all major cell phone carriers and retailers like Best Buy are also going to accept pre-orders for the iPhone X, so consider these as options too–especially if Apple’s website floods with traffic. 1.2 Thinking of Apple’s Upgrade Program? 1.6 Need to Cancel a Pre-Order? 1.7 What About SIM-Free & Unlocked Walk-In Purchases? 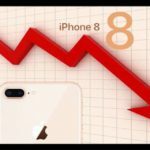 Apple launched the fancy OLED iPhone X, the less expensive iPhone 8 Plus and the iPhone 8 models in September. 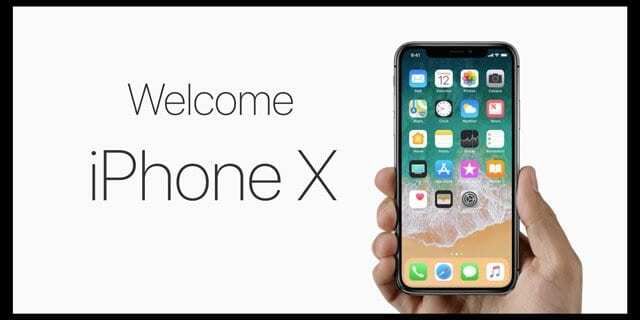 The newly designed iPhone X (called the ten, not the “X”) is the most anticipated iPhone model in many years! Apple’s anniversary phone, iPhone X comes with many features, including an OLED screen that might end up restricting supply. There have been numerous reports pointing to limited availability over the past few months. Let’s not forget last year’s iPhone 7 models where pre-orders of the iPhone 7 and iPhone 7 plus in Jet Black sold out within hours. If you have $1000+ to spare and eagerly await this 10th-anniversary model, pre-order the iPhone X instead of waiting. The pre-ordering process is available to customers on Friday, October 27 at 12:01 a.m. PDT on apple.com and via Apple Store app. And units start shipping Nov 9th. Remember that preorders start in the USA on Friday at 12:01 a.m Pacific (or 3 AM Eastern!!) So check your country’s time to ensure you hit this same timeframe. You should set up an alarm or try to get the pre-order in before you decide to call it a night! It is important that you remember that Pre-ordering cannot be done in person at the Apple store. Customers are able to pre-order iPhone X starting Friday, October 27, in the following nations: Andorra, Australia, Austria, Bahrain, Belgium, Bulgaria, Canada, China, Croatia, Cyprus, Czech Republic, Denmark, Estonia, Finland, France, Germany, Greece, Greenland, Guernsey, Hong Kong, Hungary, Iceland, India, Ireland, Isle of Man, Italy, Japan, Jersey, Kuwait, Latvia, Liechtenstein, Lithuania, Luxembourg, Malta, Mexico, Monaco, Netherlands, New Zealand, Norway, Poland, Portugal, Puerto Rico, Qatar, Romania, Russia, Saudi Arabia, Singapore, Slovakia, Slovenia, Spain, Sweden, Switzerland, Taiwan, UAE, the UK, theUS and US Virgin Islands. Store availability starts Friday, November 3rd. Thinking of Apple’s Upgrade Program? The iPhone Upgrade Program is ONLY available for iPhone X at Apple’s website, the Apple Store App, and via Apple Stores in the US. The upgrade program is currently NOT available in any other country–we sincerely hope this changes over the coming months. We highly encourage you to join the Apple Upgrade Program. Why? First of all, it’s not tied to a carrier so if you get a better deal somewhere else, you can move your iPhone as long as that carrier supports your iPhone model. 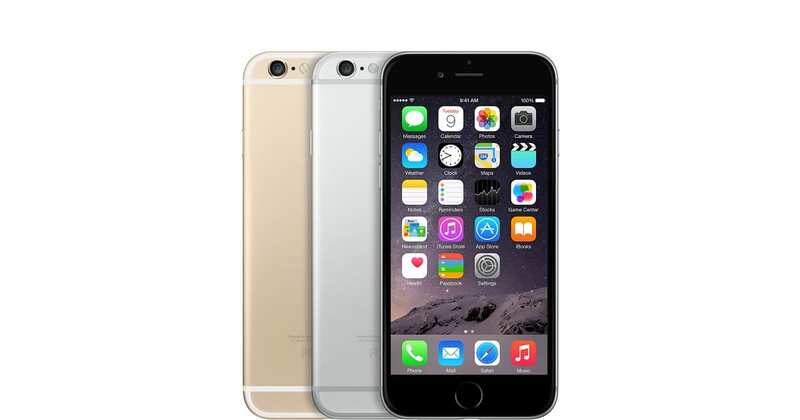 No more financing your iPhone through your carrier or committing to a multiyear service contract! Awesome. And you get to choose ANY iPhone MODEL, COLOR, and SIZE you want. And, the best reason is you get a new iPhone every year. Once you’ve made 12 payments, all you need to do is trade in your current iPhone and start a new Upgrade Plan with Apple. And if you don’t want to upgrade, just continue to pay your monthly fees and you own outright it at the end of the term. This year, and we imagine future years, many Apple Upgrade Program customers got a head start on pre-ordering their iPhone X. If they are eligible, all they need to do is use the Apple Store app on your to get ready for pre-ordering. That means they speed through checkout a lot faster than regular folks. 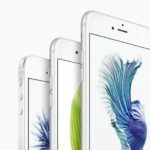 You can join the iPhone Upgrade Program online with if your carrier is AT&T, Sprint, or Verizon. To join with T-Mobile, visit an Apple Store. Are you a current Apple Upgrade Member? If you are a member of the iPhone Upgrade Program already, check if you’re eligible to upgrade and get a head start on that iPhone X upgrade now. This head start program is only available until 4 p.m. PDT on Thursday, October 26. Don’t forget that most carriers have options to pre-order an iPhone X through their website or app. So rather than ordering directly from Apple, pre-ordering an iPhone X with your carrier. 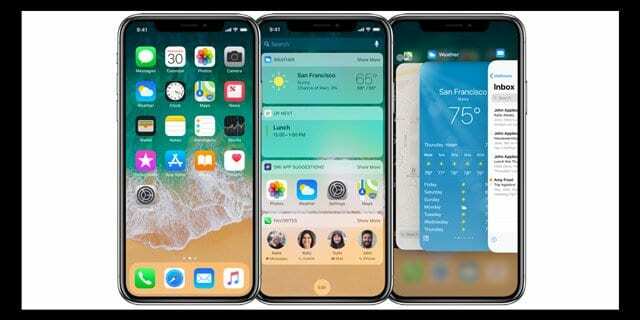 Most carriers plan to start the pre-order process at the exact same time as Apple (Oct. 27th at 12:01 a.m.) So take a look at your mobile company’s website, facebook page, or give them a call to find out your options. A few carriers are offering incentives for trade-ins or other customer promotions, such as Sprint’s plan to save up to$35 when you purchase an iPhone X from Sprint. Sop be prepared and check out these options as well. There are two options when you place an Online preorder. You can either order for delivery to your doorstep or order for pickup from a specific local Apple Store. Once you have placed your order, you will be able to review and track your order using Apple’s order tracking site. Order using either the Apple website or the Apple Store phone app. Since we fully expect massive traffic on the Apple.com site when the pre-ordering starts at 12 AM Pacific, your best bet is to place your pre-order using the Apple Store app. Make sure that your Apple-ID is kosher and working on the Appstore app before the pre-order time. It ‘s important that you decide the model, color, and storage requirements before you are ready to pre-order. Making decisions at 3 AM EST is probably not the best time. You can only buy the new iPhone from your local Apple store during the initial release. Our understanding is that all pre-orders (in the US) require that you have a carrier contract with Verizon, T-Mobile, AT&T, or Sprint. New this year for the initial iPhone X public release is Virgin Mobile, for folks on pre-paid contracts! However, you cannot pre-order iPhone X’s for Virgin–these are available as in-store purchases only at the official release on November 3. Virgin Mobile now only sells iPhones, hence the addition of the iPhone X to its lineup before any other pre-paid services! From what we know, the pre-orders will NOT have SIM-Free carrier-unlocked (or Virgin pre-paid) iPhone X’s available for sale. 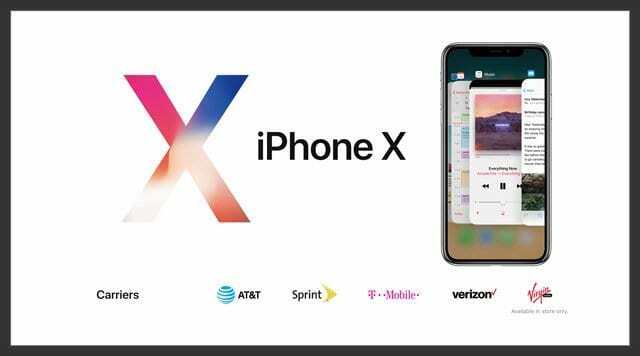 You must have a Verizon Number to pre-order a Verizon iPhone X model, AT&T Number to pre-order an AT&T model and so forth. And if you have a prepaid account, they, unfortunately, do not count! If you are lucky enough to pre-order, once your phone is ready for pick-up Apple sends you an email or text. Again, from what we know Apple will NOT hold your iPhone X until you arrive. Need to Cancel a Pre-Order? Finally, you should be able to cancel your pre-order, as long as it’s before your scheduled pick-up date. Even then, when you don’t pick up your iPhone X within the allotted timeframe, Apple puts that phone up for public, in-store sale. So ultimately, if you don’t receive the iPhone X, you don’t pay for it. What About SIM-Free & Unlocked Walk-In Purchases? However, before you jump ahead and purchase a Verizon model, take a look at the iPhone X model supported bands and make sure your mobile carrier supports that model. And remember that you can ONLY pre-order a Verizon iPhone X if you (or someone you know) has an active Verizon mobile post-paid account. Apple confirmed they are holding some iPhone X’s for walk-in sales in its Apple Stores around the globe. iPhone X goes on sale in more than 55 countries and territories on Friday, November 3 at 8:00 a.m. local time. Stores are expected to have VERY LIMITED iPhone X available for walk-in customers, so arrive early before that 8 a.m. store opening. When you choose pickup from the store, that reserves a phone for you at that store on launch day – Apple guarantees you that phone as long as you show up within the allotted time. 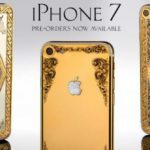 The pre-ordering makes it convenient in that you will probably have to wait for only a short line if you are picking up your iPhone from your local store. The other line ( the really long one) is usually for the walk-in purchasers. Stores do carry surplus stock to meet the walk-in demand. Chances are that you may wait in this line for hours and not end up getting the device if the stock runs out. And with production delays and limited stock, there are NOT going to be many iPhone X’s available for in-store walk-ins! 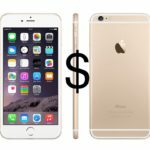 If you enroll in the iPhone Upgrade program, you can choose to upgrade to the newest iPhone model if you wish provided you have already made 12 monthly payments on your existing iPhone. Please note that Apple does not prioritize IUP members for the upgrades. They may have to wait if there is a short supply of the new iPhone X. Its that time of the year already if you have been saving up for the iPhone upgrade. Good Luck with the Pre-ordering process! Exciting iPhone 7 Models Handicapped by Samsung’s Capacity ? Does Siri work in all countries? iPhone 7 Luxury Model with 256GB. Anybody? I pre-ordered for store pick up but my order shows my home address as the delivery address. Is this correct?? Please look at your order and call customer support referencing your order number and confirming delivery status. If you ordered via your carrier, call them and if via Apple, call Apple. So, as an existing upgrade program member, I was able to get pre-approved and order my iPhone X within the first few minutes after 12:01 PDT. This was great, but this year looks to introduce a potential problem for the 2018 iPhone release. The release date this year was delayed (for the X) by a month. In order to be eligible next year, I’ll have to have completed 12 payments. But because of the delay, if next year’s release returns to the normal end-of-September cycle, I’ll only have made 11 payments. Are you following me? If the rules hold up, all of the loyal upgrade members who got the X this year at release, who have pretty much joined mostly so they can get each new year’s latest iPhone at release, will be shut out of being able to upgrade for a month (not to mention that we were forced to make 13 payments this year before we could upgrade to the X). 1st world problems to be sure, but that’s why we’re here, right? I believe you can make additional payments throughout the year (if you can afford to.) By doing so, you should be able to make up the difference. You are doing a good job answering all these questions! since they are in the pre order process i take it you know a little more by now. i cant really find the answer to my question in the below..
my mom in law has a Verizon account, she is willing to pre order one for me, thing is, apple website says that it comes with a contract, even when she clicked pay in full..
could you please tell me how this all works,, shes of the older generation 🙂 and im not there at the moment so cant look into it..
short: how do you order an iphone X with Verizon account but without a contract, just pay in full..
and is it possible to have Verizon get the sim lock off? All pre-orders for the iPhone X are carrier based–meaning they come with an agreement for service with a particular mobile phone carrier, even when you pay full price. So as of today, you cannot pre-order a SIM free iPhone X meaning that all pre-order phones come with a carrier agreement for service. However, because you paid full price and purchased from the Apple Store, when you receive the Verizon iPhone X it is pre-packaged with a Verizon SIM card but the iPhone itself is unlocked. So you should be able to pop out that SIM (if it’s inserted) and pop in the SIM card for the carrier you want. Your carrier must support that Verizon iPhone X model (A1865). So no, even though your mother in law had to choose a verizon plan, since the phone is fully paid you shouldn’t have to stick with Verizon. In November, I will be in Japan on vacation and I intend to buy an iPhone X in Apple Store. Anyone knows if the iphone X will be unlocked if I buy it in full price ? The Apple store says if I purchase a AT&T iPhone X at full price it comes unlocked with a AT&T sim. I hoping that I don’t have to verify any account because I Am from Canada and AT&T is compatible with my carrier. From what we understand, Apple does verify account information even when paying full price. That’s the info we know right now. This may change so I say give it a try! Since you are in Canada, they should have Canadian carriers listed instead of US carriers. So maybe your carrier is on that list tonight! One more question, if I will get my phone delivered at my residence so will the invoice state the date of the date the phone is delivered or the preorder date that is 27? If you pre-order an iPhone X and choose to pick it up, Apple sends an email or text letting you know your pickup dates & times. If you do not pick-up within that stated window, Apple will release that iPhone X to the public for sale. Obviously, you are then refunded any money since delivery did not take place. Apple does not typically hold iPhones beyond their stated delivery window. You need to call Verizon and ask specifically about your account. This answer depends on your history with Verizon as well as your credit worthiness. Sorry that we cannot assist further. I have a plan with T-Mobile and I’m almost done paying for my current phone. If I want to pre-order the iPhone X, how do I do that? Is it easier to go in the T-Mobile store on the 27th of October? Or would it be easier to pre-order it on the Apple website? Another question is, I know payment plan is available, but how much do I need to pay upfront when pre-ordering iPhone X 64G? Sorry for all the questions, it’s my first time pre-ordering and I am really confused. lol. Thank you in advance! Yeah, it is confusing, especially for T-Mobile customers! Are you part of a T-Mobile iPhone upgrade program? If so, check with T-Mobile on your eligibility and how much you’ll be charged for the new iPhone X based on the current value of your iPhone model. We can’t answer specifics since this is information only T-Mobile can provide you. As long as your account is in good standing as well as your credit history, you should be able to qualify for Apple’s Upgrade program. For T-Mobile customers enrollment to this program is only available in-store only. The advantage of Apple’s program over your carriers is that the cost of your phone AND AppleCare+ coverage is spread out over 24 months with 0% interest (if qualified.) Once you’ve made 12 on-time payments, you can upgrade to the next iPhone model. As far as the online pre-order, since you are a T-Mobile customer you can only purchase the phone via your carrier’s plan or full-price. However, Apple has announced a “head-start” program for eligible folks upgrading. No harm to check that and see if you can get some of the paperwork out of the way. You need to download the Apple Store App, search for the iPhone X > Models and Pricing, and then look for a banner with the text “In the iPhone Upgrade Program? You may be eligible to get a head start…” Tap Find Out Now–you might get a pleasant surprise. I spoke with an Apple Service representative–their advice is to call T-Mobile and find out if you can pre-order an iPhone X directly from the T-Mobile website on 10/27. According to this Apple employee, they don’t know that answer. Sorry, we don’t have more info. You shouldn’t have any problem if you’ve shipped things there previously using that same credit card. Also, check your Apple ID and add in your work address as a shipping address, this should help as well. Of course, to mitigate ANY PROBLEMS it’s best that the addresses match.Call your credit card company and see if they allow you to register an alternate address or place in a “temporary” address for billing purposes–some companies allow this, other do not. I heard, Apple going to realse sim free version of iPhone x at launch/ pre order day? Thanks. According to an Apple Team Member, the option for selecting a SIM-Free version will be available at some point, possibly even available at pre-order. Even this employee doesn’t know if or when the SIM-Free iPhone X releases. As of today, no SIM-Free option is available on the iPhone X pre-order page. That same Apple employee suggests that we check the Apple iPhone Pre-Order page periodically this week to see if Apple adds the SIM-Free version to its pre-ordering. If not, a SIM-Free version of the iPhone X won’t be available until after the initial launch on November 3rd or up to a few weeks post-launch. That’s the latest we know! I am planning on coming to new york to buy the iPhone X. On the apple site it says if I pay the price at once (with the t-mobile variant) the phone will be unlocked but comes with a t-mobile sim. does this mean i can just not put in the sim that comes with the phone and just put in my own sim card (from the Netherlands)? 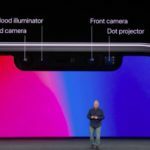 Hello there Thanks for the info on the iPhone X–I am suggesting this article to any of my friends also wanting a pre-order. I spoke with support team and they confirmed that there was a no-carrier option before pre-order for iphone 8 opened so obviously it existed during pre-order.By that measure there should be a no-carrier option for iphone x right now if there are willing to offer.Since it isnt there can i assume that there wont be a pre-order no-carrier option on the 27th october ? I was under the impression that if I pre-order on 27th soon enough I was gonna get iphone x delivered to my home on 3rd nov. Isn’t that the case ? Will there be a delay in deliveries no matter how quick I pre-order ? How does that compare to pre-order pick up from the store ? My home has 60mbps internet speed.Does that work ? or do i need to increase the speed to 100mbps ? Does the speed of internet effect my preorder priority ? I ask that because streaming and browsing experience is same for both 60mbps and 100mbps. It doesn’t show the difference until you start downloading.So my goals is to be one of the early people to pre-order the phone x.So Do i need a 100mbps speed internet ? You internet speed is sufficient and shouldn’t make a difference in making a pre-order. It all depends on how many people try to pre-order at the same time and of course, the stock of iPhone X’s available. As far as we know, a carrier contract is required to pre-order the iPhone X. This is the information we have to date—it could change. An unlocked, carrier-free model is being made, we just don’t know when Apple intends to release it. As far as the delivery date, it’s not guaranteed. It’s an estimate only. Apple sends out emails and texts letting you know when they ship your order. The same process is used for in-store pick-ups except the text or email lets you know when you can pick up your phone in the store. The disadvantage of in-store pick up is that if something delays you, like work, and you are unable to pick up your device is the stated timeframe, Apple does not hold your order. They release it to the store for public sale. Obviously, if you get it shipped to your home this is not the case, unless you do not accept or take delivery—then it’s returned as any package would be. 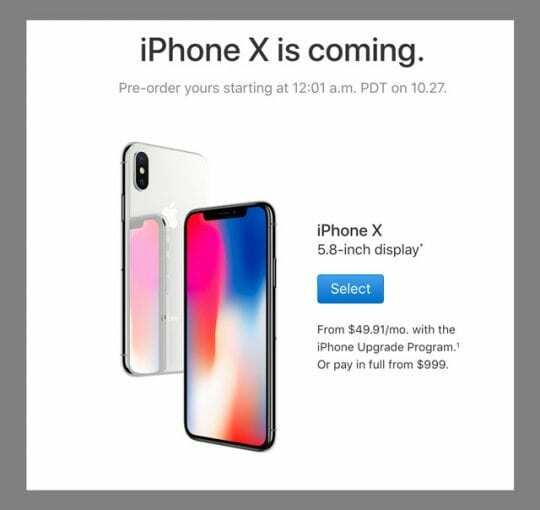 Your best bet to get your iPhone X as soon as possible is to order at 12 a.m. on 10/27–remember that this is the evening of 10/26-10/27. Three short questions: I’m going to be in USA from November 14 to 28th. First: Do I need to actually have a Verizon number to be able to do the Verizon device pre-order? Second: If I’m lucky enough to pre-order an iPhone X online, will the Apple Store hold it till my arrive? And last one: Can I cancel my pre-order if my iPhone doesn’t finally ship between my actual travel time? Our understanding is that all pre-orders (in the US) require that you have a carrier contract with Verizon, T-Mobile, AT&T, or Sprint. From what we know, the pre-orders will NOT have carrier-unlock iPhone X’s available for sale. So to answer your question (with our best knowledge to date) you must have a Verizon Number to pre-order a Verizon iPhone X model. And prepaid accounts do not count! Finally, you should be able to cancel your pre-order, as long as it’s before your scheduled pick-up date. Even then, when you don’t pick up your iPhone X within the allotted timeframe, Apple puts that phone up for public, in-store sale. So untilmately, if you don’t receive the iPhone X, you don’t pay for it. While it’s not possible to buy the Verizon iPhone X online without a contract, you can buy it at the Apple Store, if it’s in-stock (which is doubtful, at least during the initial release.) You need to pay the full price and they do not need to verify a carrier account when walking in to purchase. So my understanding from your reply is that as an international person that interested in a phone that will work in my country (Israel) i need to choose Verizon model iPhone X (A1865) ? plus, if ill go with the first option , you said that I will need a active Verizon number to be able to progress with the purchase , can you please clarify on that ? BTW since i have a short window on buying the iPhone (until the 12.2) from previews pre orders , how much time passed until apple open the sim free option ? do you think i will be able to buy a free sim one or maybe its better to order the Verizon model iPhone X (A1865) one ? Sorry for the delayed response. Yes, we understand that the A1865 is the model for the SIM-free factory-unlocked iPhone X version. These are sold via Apple and Apple Stores. But not, apparently at the pre-order and possibly not at the initial public release. We siply do not have that information available from Apple yet. As far as we know, you will need an activated Verizon post-paid account to pre-order an iPhone X model A1865 on Oct. 27th. Certainly, Apple will release a SIM-free unlocked iPhone X at some point in the coming months or early 2018, we just don’t have any information as yet on that exact date. Here are the cellular band specs on the Verizon model A1865, check with your mobile carrier in Israel to see what bands they use for service. if i choose a crier and then “pay in full” does it means i get a free sim version that i can use world wide with my local non us carier ? 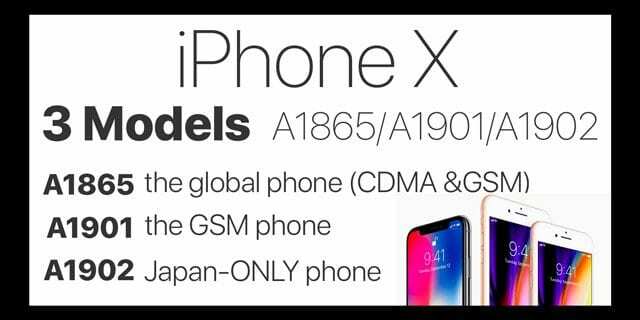 It depends on the model of iPhone X. Apple is making three different iPhone X models—A1865, A1901, A1902 (Japan ONLY.) The Verizon model iPhone X (A1865) is considered the global phone and works on both GSM and CDMA networks. It’s also the SIM-free factory-unlocked version at Apple Stores. The iPhone X A1901 is the GSM version. It’s the model for AT&T and T-Mobile in the US and in several European and Asian countries. Check the tech specs for more info on your country. For the pre-order you have to choose a carrier and verify an active account with that carrier. Then you’ll see an option to pay in full—however, these pre-order phones will not be SIM free and may not be unlocked (Sprint notoriously locks their iPhones.) Verizon never locks iPhones, that’s why it’s usually the recommended model to purchase. You are able to purchase an unlocked, SIM-free iPhone X from Apple Stores; however, these will likely not be available at the release and are not available (as far as we know) at the pre-order. I want to Pre-Order two iPhone X’s in Japan, Tokyo (64BGB & 256GB). I intend to use these phone in India. I will be in Tokyo on 17th November 2017. Would it be possible to collect it from the Apple Store in Tokyo, once I reach there?.. Or, would it be possible for someone else to collect it on your behalf? The pre-order process allows you to purchase up to 2 iPhone X’s (that’s our understanding; however depending on demand Apple could limit each person to 1 iPhone X per purchase.) During the pre-order process, you are provided a window of delivery estimates–this are not guaranteed. So that means the phones might arrival as estimated or they may arrive earlier or later. You won’t know your exact arrival date until you receive an email from Apple. So targeting Nov. 17th is possible but not something you (or Apple) can predict and confirm. We don’t know for sure about the iPhone X’s policy, but generally, Apple allows someone else to pick up your pre-paid order. When filling out your order details during the pre-order, make sure that if someone else is arranging your phone pickup, enter his or her contact information in your order information. The person making the pickup must be carrying a valid photo ID that matches the name you place into your order. Will be sim free version of the iPhone x? When pre ordering start. our understanding in speaking with Apple Sales team is that you will be able to order a carrier free unlocked model when the pre-order starts on the 27th. The maximum number of iPhone x that you will be able to re-order is two. I am going to Miami from South America, and I would like to buy iPhone X 256gb, so since than is not for certain I have it in closest store where I will be lodged, I just will walk in any store and try find it. I was wondering to try call the store and ask for any sales person reserve one for me next day but I don’t think they would do it. You are correct, an Apple Store will not hold your phone for you. However, if you purchase online and it says it’s in-stock at the store you can pay online and pick the phone up. However, it’s unlikely that any Apple Store will have iPhone X’s in-stock at the release and more than likely they will not be available in-store through the rest of this year. It’s possible but not probable. Next year (2018) is probably a safer bet for iPhone X walk-in purchasing. Hey I was thinking of buying an iphone x in store at the end of december/beginning of december. From past experience do you know if that would be possible? Or are store stocks sold out for months? Frankly, we just don’t know! No one really knows–even Apple. It depends on demand–sometimes things are hits and sometimes it takes more time for the public to really embrace a new device. AirPods are a great case in point–on one expected them to be such a super hit from the get-go, but within hours of sale, you couldn’t get a pair for months due to demand. And this year, the iPhone 8 is available in stores as a walk-in where last year lines were out the door for weeks. So, yup, it’s anyone’s guess about the iPhone X. Your best bet to secure an iPhone X is to pre-order it. Even with that, you’ll receive an expected (or estimated) delivery window–and that’s still no guarantee. I’m planning on pre-ordering on Oct. 27th just to be sure. Unfortunately, that information is not yet available. When the pre-orders start for the iPhone X, on Oct. 27th, your order estimates delivery time. Be mindful that this is an estimate, it is not a guarantee. How does the payment process work when preordering the iPhone x? I know I have to put down my Apple ID and probably credit card, but will it charge me right then and there if I want to pay it over time? And also, if I wanted to make a payment of $400 then pay the rest over time would that be an option? As far as we know, Apple is offering the iPhone X as an option in its Apple iPhone Upgrade program which results in a monthly charge. You essentially pay over time. The full cost of your phone and AppleCare+ coverage is spread out over 24 months with 0% interest. And of course, each cellular company also offers an iPhone upgrade plan which includes the cost of your phone, paid in installments, and your monthly service charges. The advantage of the Apple program is it automatically includes Apple Care +–it’s built into the fees. As far as paying $400 up front and then paying the rest over time, we’re not sure if that’s an option with Apple. It’s should be an option when purchasing through a carrier. Please call Apple directly to find out this information–1-800-275-2273. There is a chance that preorders won’t be available on those dates for pickup, so confirm first. Also, make sure the phone you purchase works in Europe. Is there a limit on how many units you can preorder at once? Apple has not released that information yet. So stay tuned! We’ll update the article with those details once known. If history is any indication, Apple usually limits orders to 1 or 2 devices in any one order. But we shall see! How much do you have to pay when preordering? Pre-orders are the same price. 64 GB for USD $999 and 256GB for USD $1149. There are also options to pay over time using Apple’s iPhone Upgrade Program or your Carrier’s Upgrade Option. With the Apple program, AppleCare+ coverage is included in your monthly payment. If you get the X, let us know your thoughts when you have the chance…and of course, when you actually get the phone!!! Is there a limit to how many iPhone X I can purchase if I’m a “walk in purchaser” and wait in the long line? Good question and no “official” answer on that yet. However, if history tells us anything, Apple will probably limit the number of iPhone Xs (and maybe even iPhone 8s) anyone can purchase at a single visit to the Apple Store. This was true with past iPhone releases (like last year’s 7) and we expect it will be true this time around. The workaround is to make multiple visits—and consequently, wait in those long lines multiple times. Enjoy that new iPhone, when you finally get it! After you pre order, what are the benefits of picking it up in store rather than getting shipped to your home address? Do you know if getting a home delivery takes longer or doesn’t ensure you’re getting an iPhone? Would I be able to purchase the new iPhone X outright when pre-ordering ? Can I get it delieved to my home address? Liana, We think that you should be able to purchase it outright and yes You can have it delivered to your home address. Paying for it gets easy if you have Apple Pay installed. In the App Store app, you can just use Apple Pay and get it all squared. Good Luck again with the pre-ordering and Thank you for stopping by.